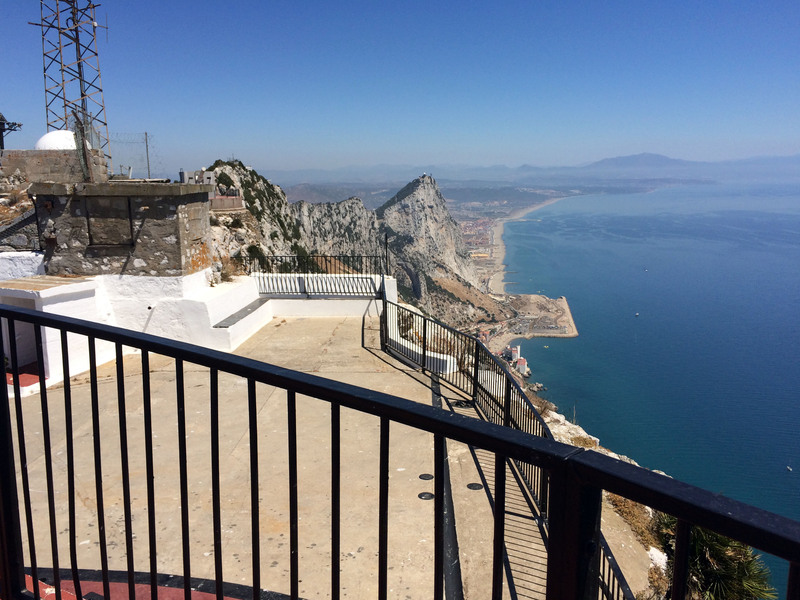 For two weeks, from late July to early August 2015, Susan and I traveled to the following places: We flew from London to Gibraltar (which Spain considers its legitimate territory -- and I agree with the Spanish thesis that Gibraltar is a colonial outpost). From there we took a short bus trip to Tarifa, Spain, which is the southernmost point of mainland Europe. 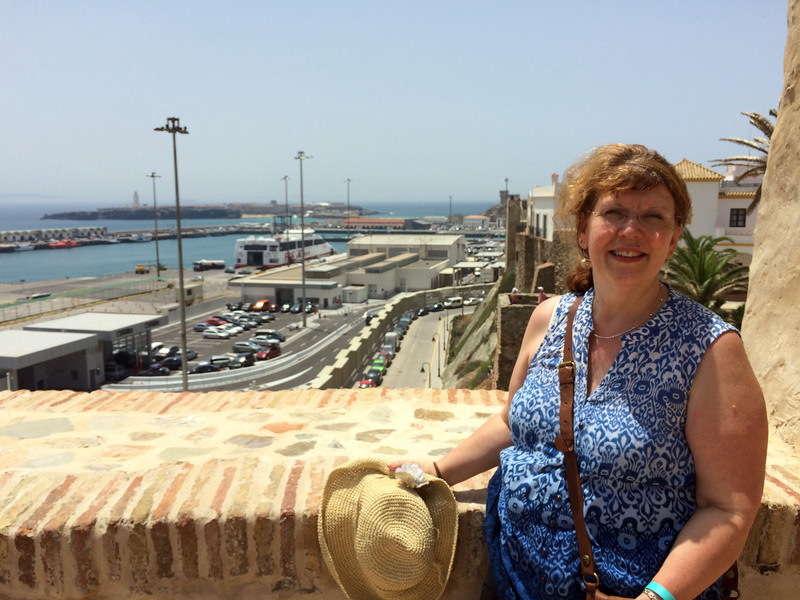 Next we took a ferry across the Strait of Gibraltar to Tangiers, Morocco. 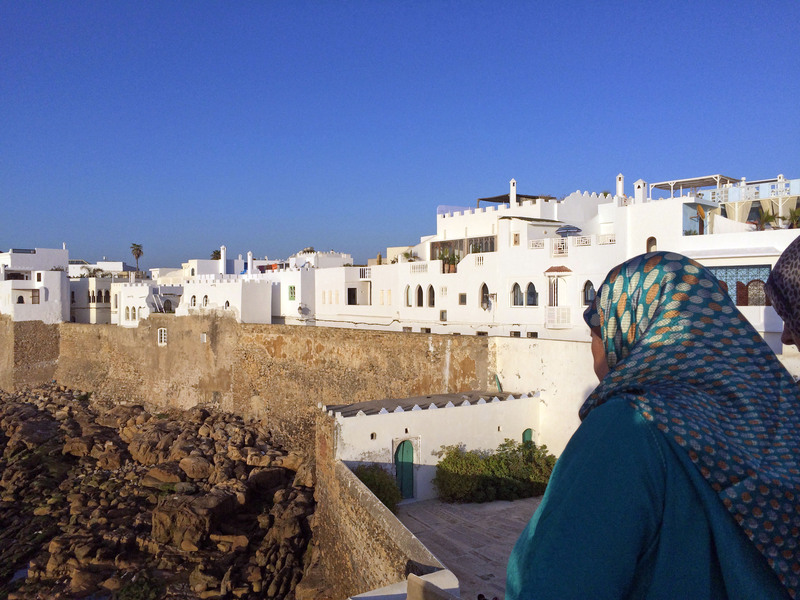 After touring Tangiers, we rented a car and drove to Ceuta, a Spanish exclave connected to Morocco. We continued by car to the Moroccan cities of Tetouan (in the foothills of the Rif Mountains) and briefly to Chefchaouen (further south and deeper into the Rif). 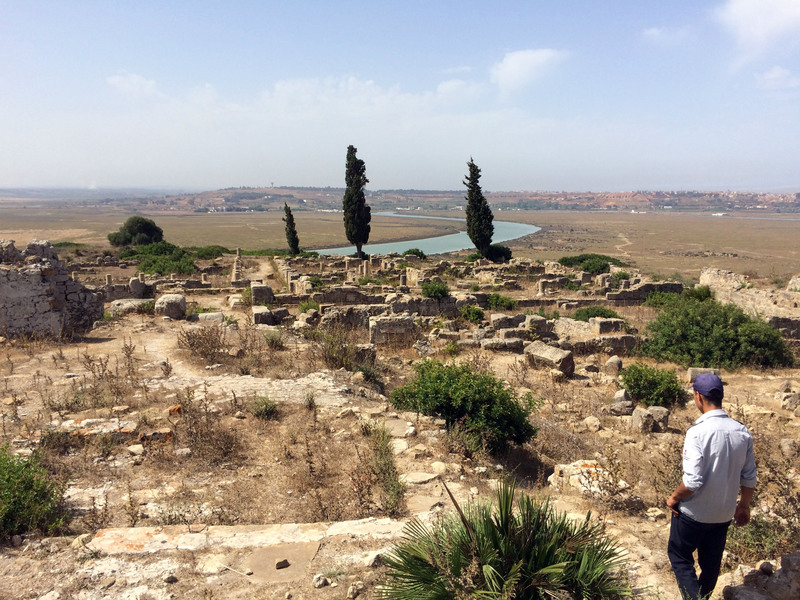 Then we drove to the Atlantic coast and stayed in Asilah, Morocco, from where we took a short trip down the coast to the Roman ruins in Lixus, about 30 km south of Asilah. We wrapped up the Moroccan portion of the trip by driving to the Tangiers airport, from which we flew to Madrid, where we toured for a few days. Shown below are a few photographs from this trip. The Rock of Gibraltar as seen from the northern side of the runway at the Gibraltar airport. This iconic view of "the Rock" looks towards the south. 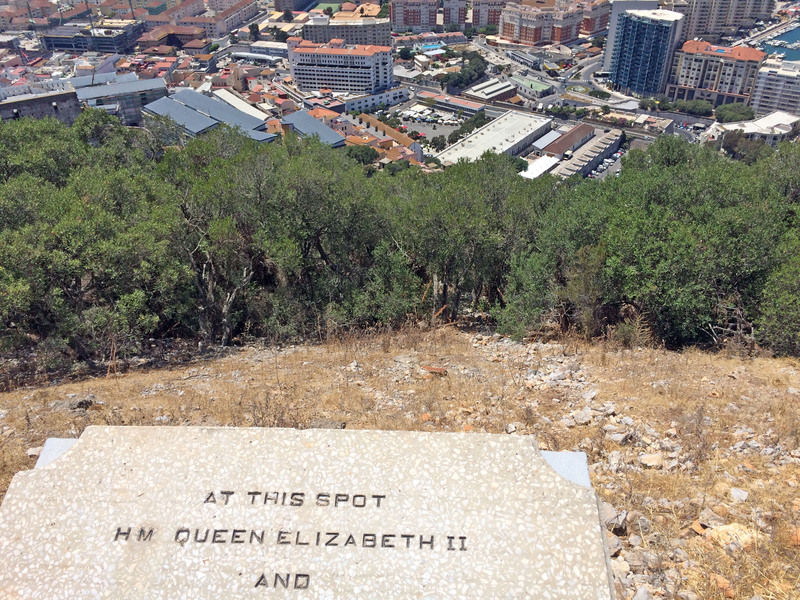 From O'Hara's Battery, which at 426 m above sea level is the highest point on Gibraltar, the southern tip of Gibraltar can be seen. 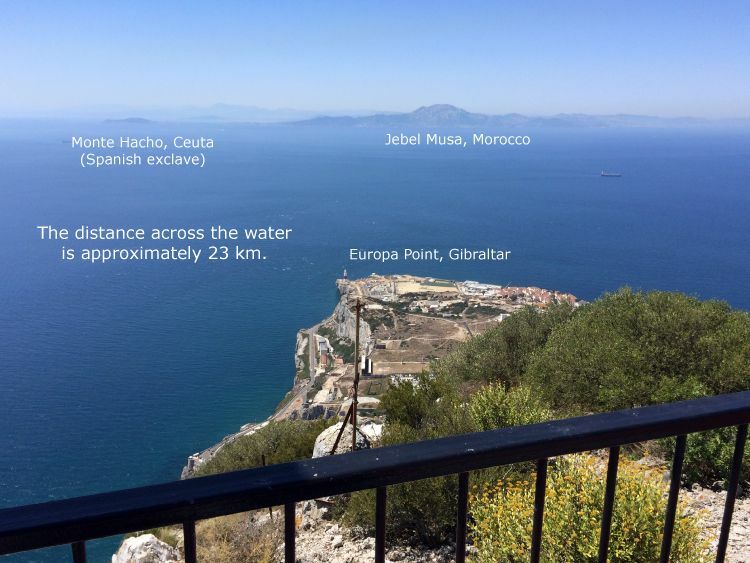 Then the view extends across the Strait of Gibraltar to Morocco and the Spanish exclave of Ceuta. Once again looking from O'Hara's Battery, but this time to the north. 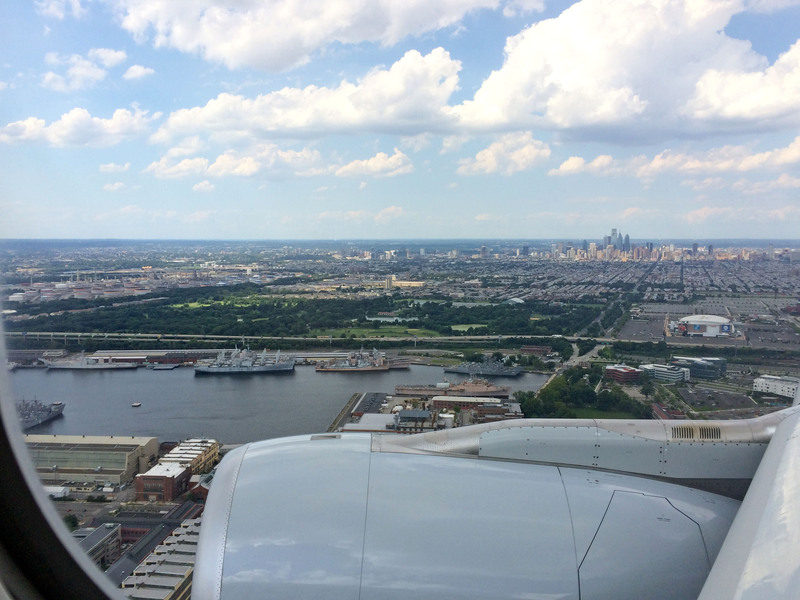 Here the view is from the south and not the iconic view from the northwest. Observe how steep the eastern slope is. The Spanish mainland lies in the distance. This spot is historically noteworthy, marking where this long-reigning monarch stood 61 years before I took this photograph. 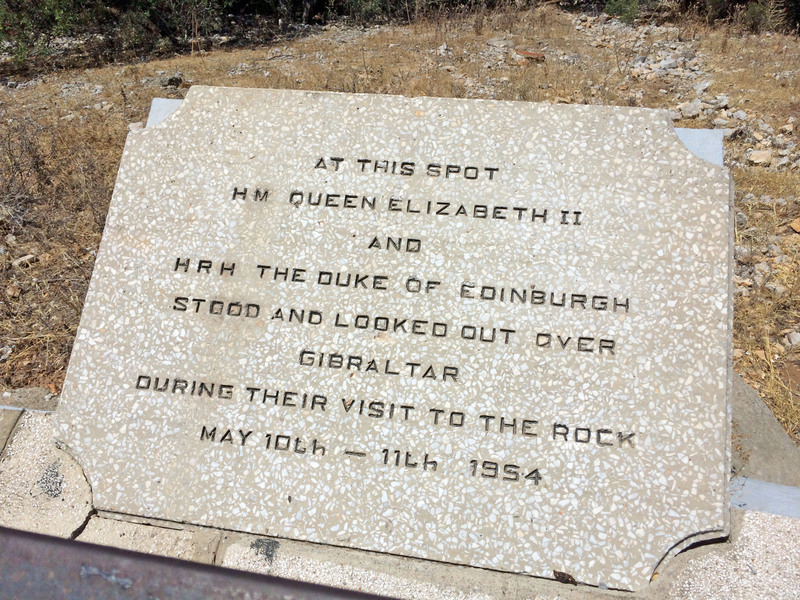 And here I have photographed just the top of the plaque so that I can also show the steep dropoff and part of Gibraltar city below. The mevieval city of Tarifa. I found the brilliant whiteness of its buildings striking. 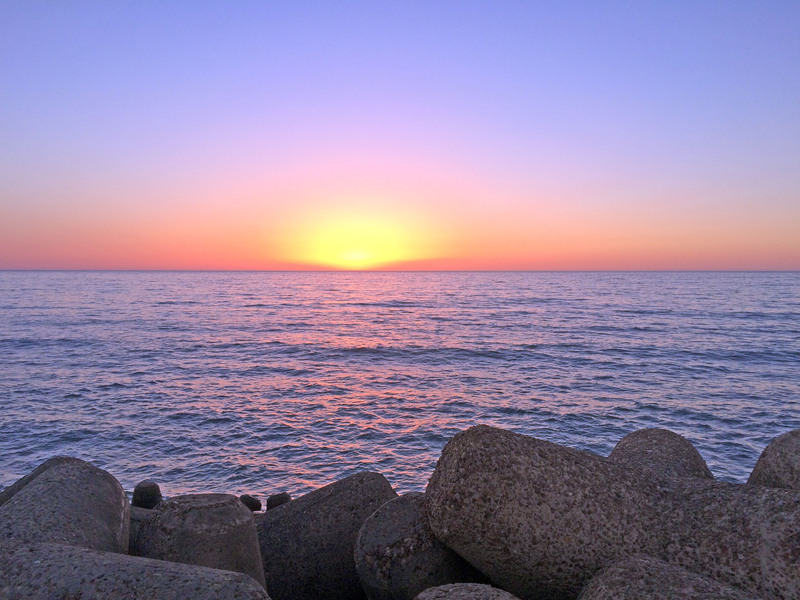 The day after shooting these several pictures, Susan and I took the ferry from Tarifa to Tangiers. 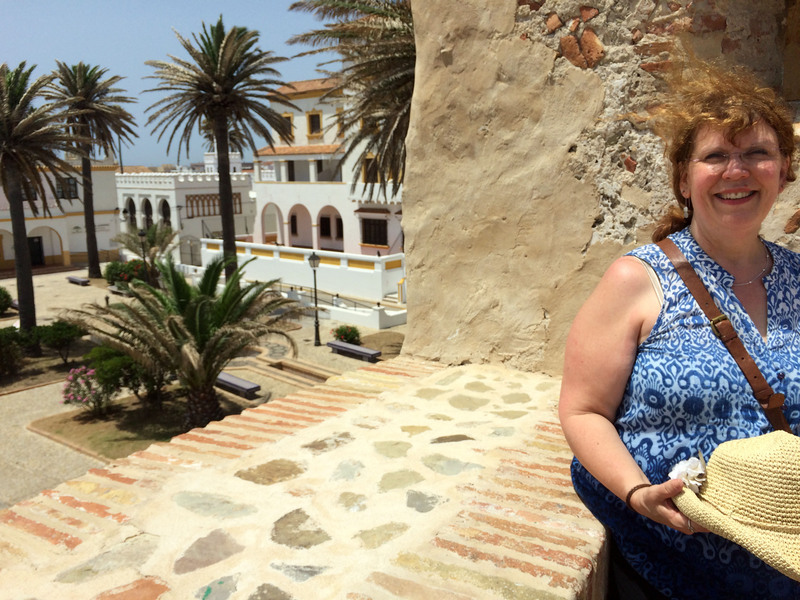 A slightly different view of Tarifa, with Susan posing alongside the inner wall of one of its still-standing fortresses. Tarifa is the southernmost point of land on mainland Europe. The small island, on which sits a lighthouse, is the southernmost point of Tarifa. Scarcely visible in this photograph, on the very left side, is the coast of Morocco. 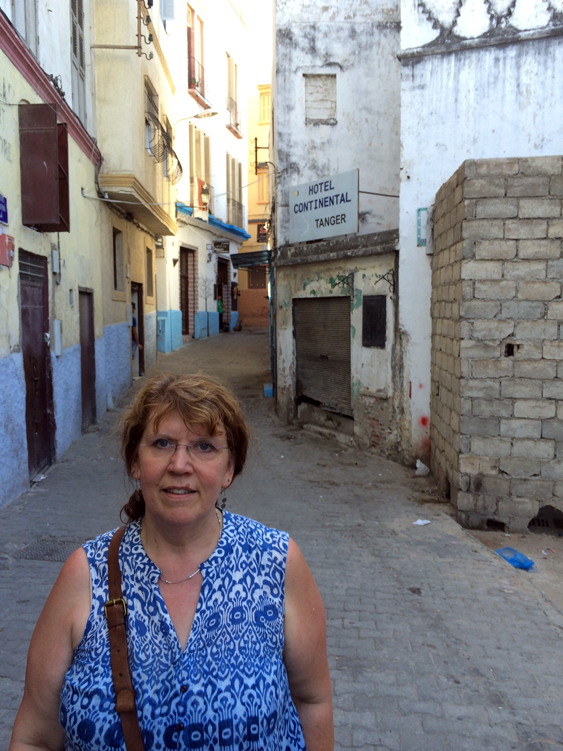 Susan stands near the entrance to the Hotel Continental, where we stayed in Tangiers. 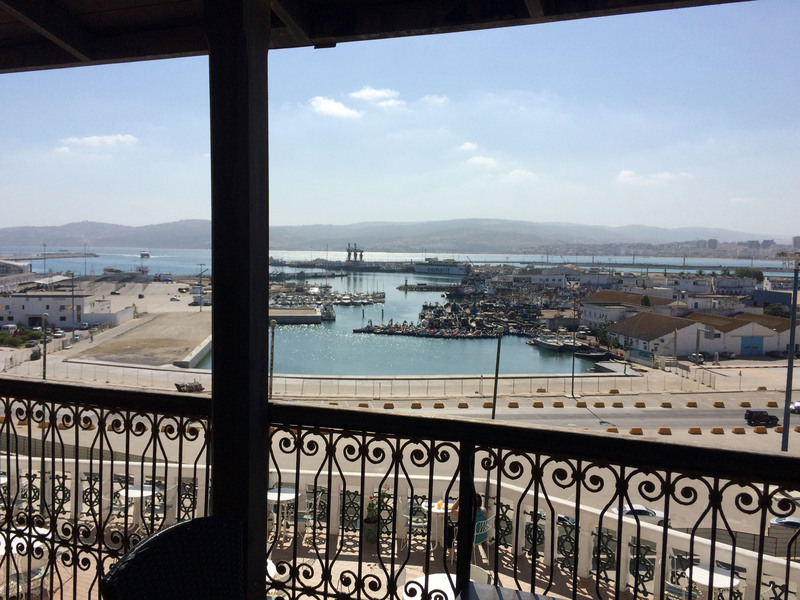 A view of Tangiers bay from the balcony of our hotel. These next four pictures, poorly focused, document our approach to the Ceuta peninsula. Ceuta is a Spanish exclave, contiguous with Morocco and across the Strait of Gibraltar from mainland Spain. We are driving from west to east. We are still in Morocco, but only a few kilometers from the border with Ceuta. Of course, as we leave Morocco and eventually enter Ceuta -- that is to say, Spain -- we had to present our passports. Observe both Monte Hacho at the eastern end of the Ceuta peninsula as well as residential and commercial areas on the lowland of Ceuta. 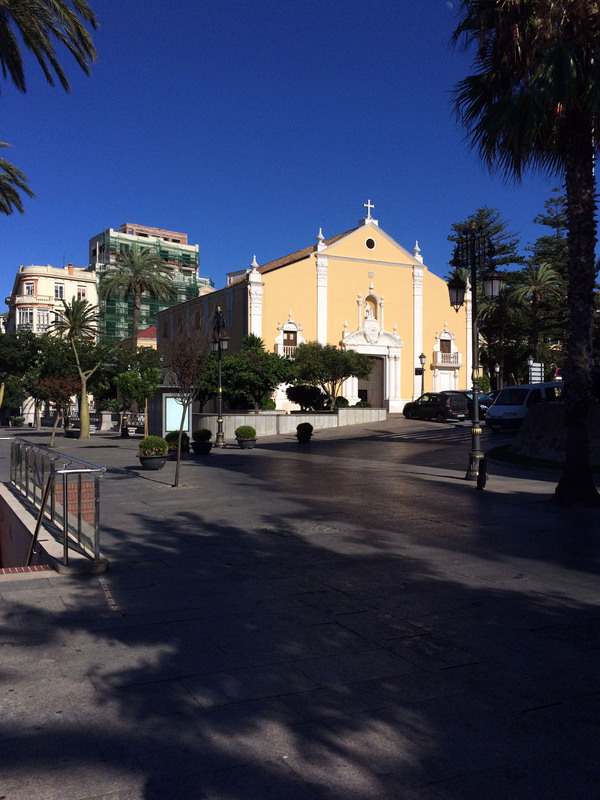 The front facade of the Church of Santa María de África in Ceuta. 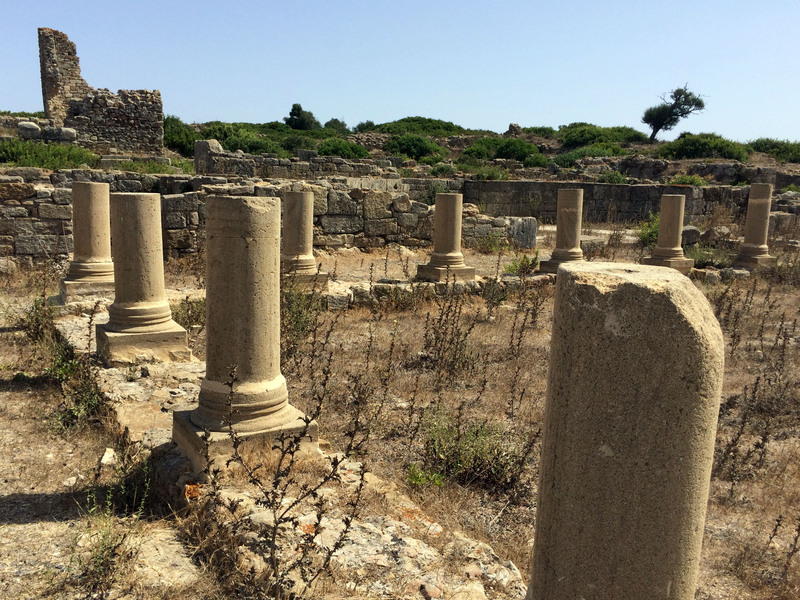 Three pictures of the ruins at the ancient Roman city of Lixus. This picture looks more or less southward, and features our tour guide. The Loukkos River lies ahead, as it wends its way from left to right into the nearby Atlantic Ocean (not shown here). The modern city of Larache lies further south in the distance. More amazing ruins. Our tour guide said that some of these columns were original, and that others were reconstructions. 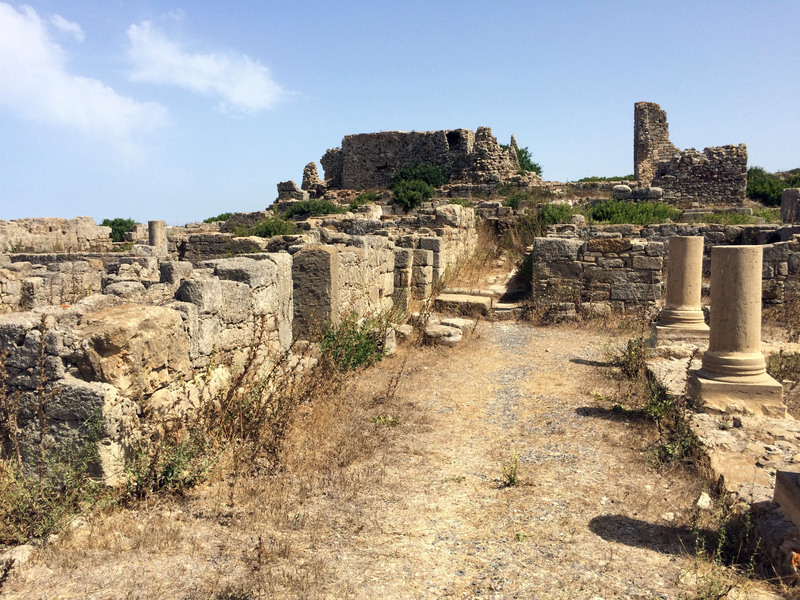 The site, about 80 meters above sea level, offers fantastic views of the surrounding area. 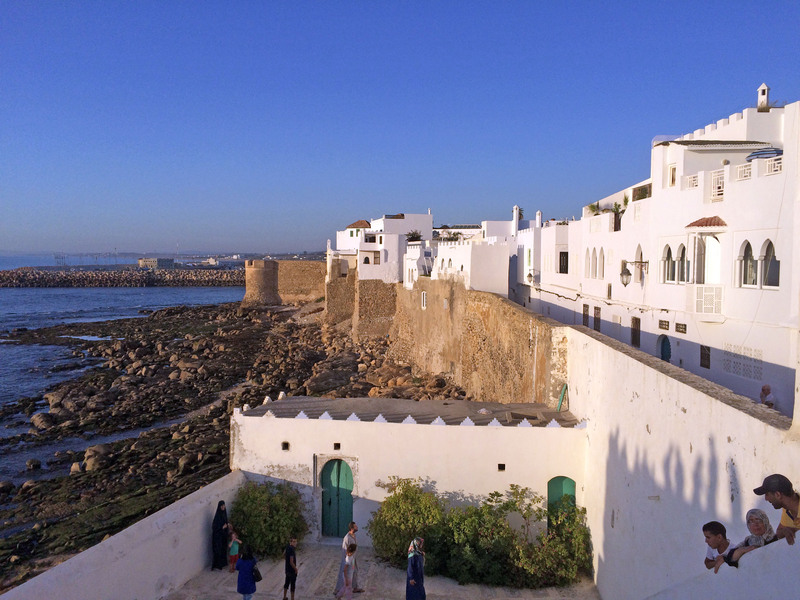 However, the Moroccan government should do a better job of historic preservation. 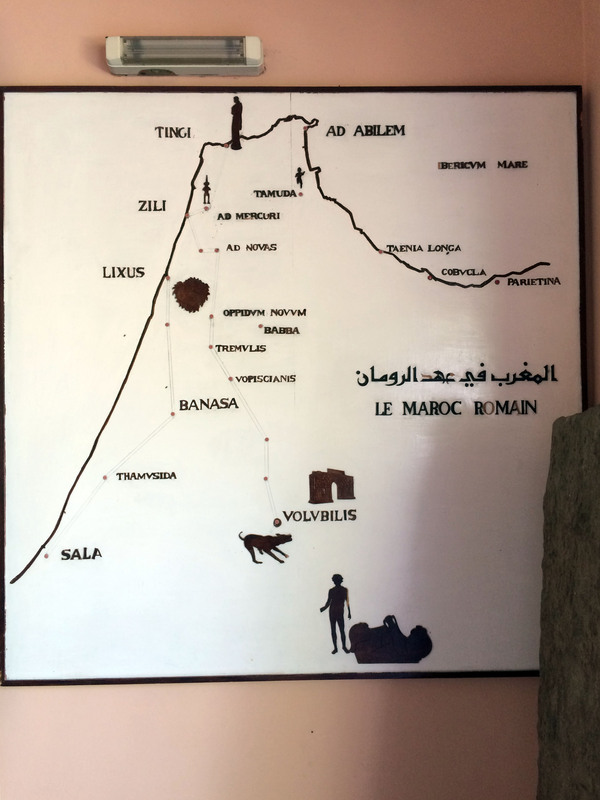 This map, which I photographed in a Tetouan museum, marks ancient Roman sites in contemporary Morocco. Note Lixus and Tingi, which is modern Tangiers. 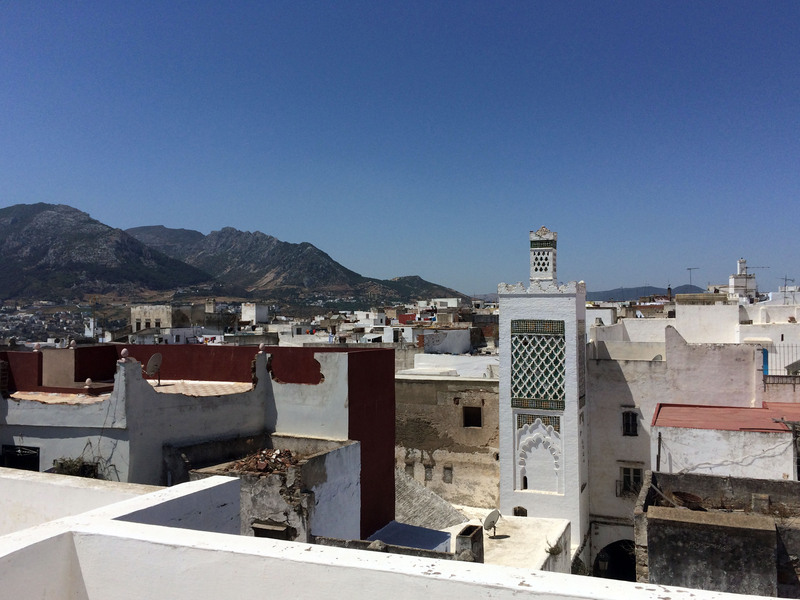 A view of from a rooftop in Tetouan, Morocco. Visible is a small portion of the Rif mountains in the background. In the foreground is a local mosque with its square minaret, the typical Moroccan style, according to a tour guide. This and the next photograph capture two instants from the walls of Asilah, Morocco. The picture looks north, with the Atlantic Ocean on the left side. 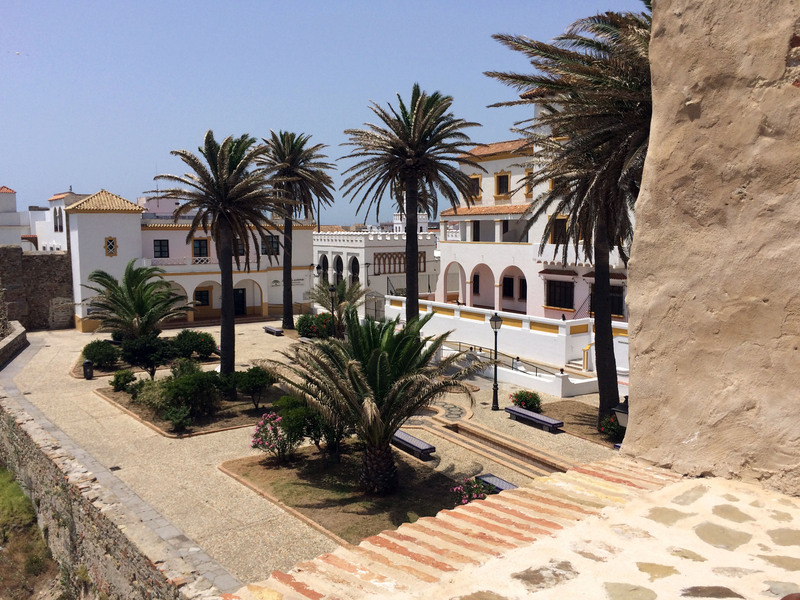 Just as with Tarifa, Spain, the bright whiteness of the buildings caught my attention. 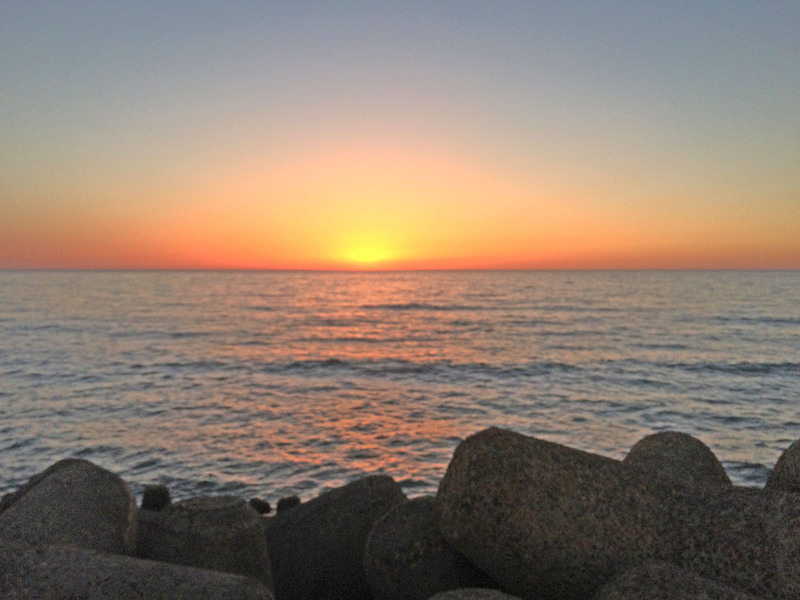 Two pictures from Asilah of the sun setting over the Atlantic Ocean. I did not edit either of these two pictures to change the colors. As I almost always do, however, I did use Levels to improve the contrast. 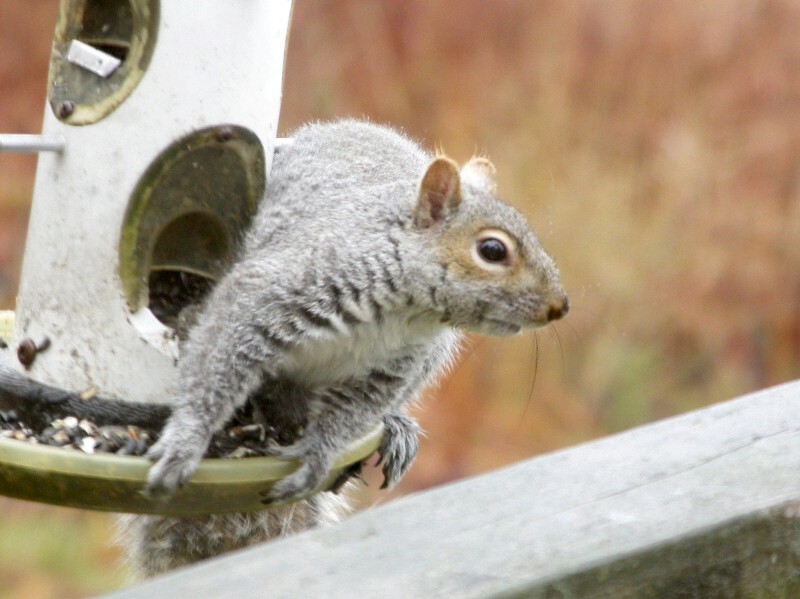 Moreover, I sometimes also use the Photoshop tool "Shadows/Highlights" to make visible what is hidden in shadows. And, in the present case, I did that to lighten the foreground. Viisible as a dark patch of brown in the center of the photograph, Madrid lies to the north as our plane approaches from the south. Madrid hugs the east bank of the Manzanares River, which flows into the Jarama River. 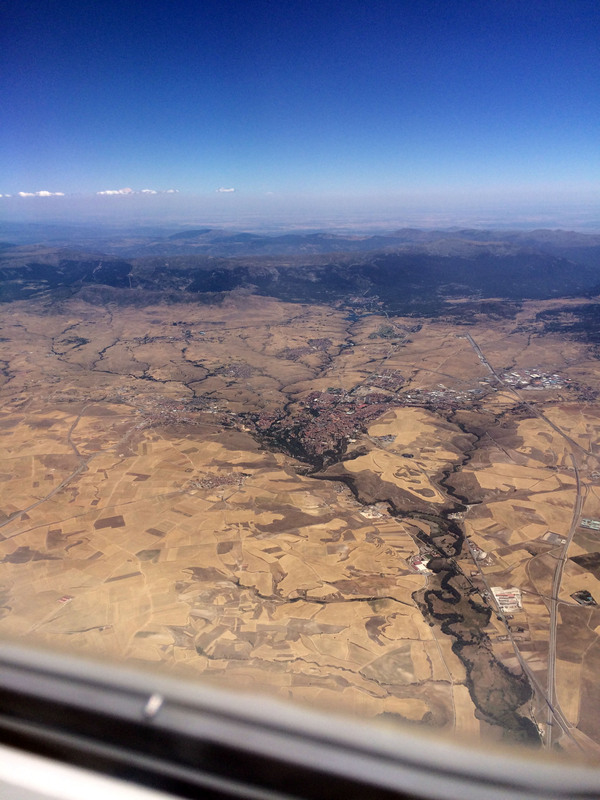 In this picture you can see that confluence, but just out of view (more or less directly below the aircraft), the Jarama flows into the Tajo River. In turn, the Tajo continues on its long journey to Lisbon, Portugal, from where it flows into the Atlantic Ocean. 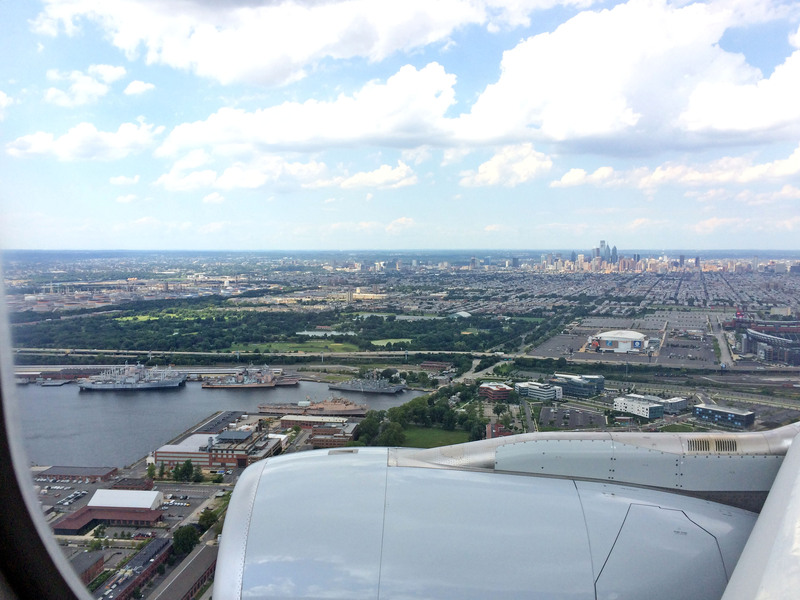 Three pictures of Philadelphia to the north, as our plane approaches the airport to land. 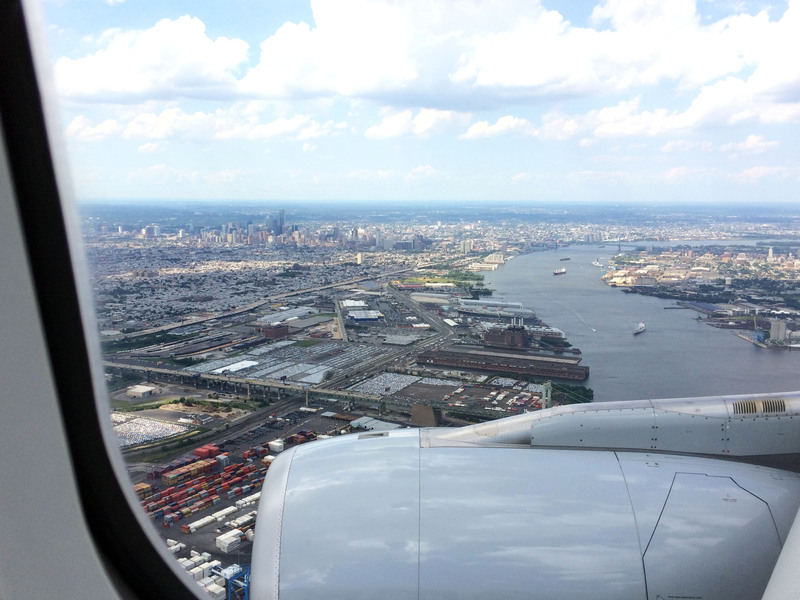 These pictures show the Delaware River.